The purpose of the Competitive Team program is to bring each of our athletes to their maximized potential in competitive gymnastics while helping her develop an emotional strength that will guide her through the sport and beyond. In addition to learning gymnastics skills we want every gymnast to gain life skills and attributes that represent strong character. Competitive gymnastics at Stars & Stripes Gymnastics Academy will give gymnasts an opportunity to develop poise, discipline, mental toughness, determination, appreciation for dedicated effort, and self-respect. It is our goal that through competitive gymnastics we can help children achieve the skills to become strong, confident athletes and people. We will offer every gymnast the best professional instruction in a well-organized, quality program along with an intense, but motivating environment where the athletes are expected to give their all. We will strive to provide the emotional and physical discipline needed for competitive gymnastics within a structure that will give support, encouragement and a “never settle for less than your best” mentality. We want to produce athletes that have pride, confidence, and a drive to push their limits. It is our goal to bring every young athlete to her fullest potential in competitive gymnastics. The Stars & Stripes staff is extremely passionate about their role in guiding gymnasts through training and helping them develop into strong, disciplined athletes both mentally and physically. We hope to install emotional strength that will help them excel in the sport and beyond. Our program puts an emphasis on discipline, perseverance, mental awareness and team unity. We are dedicated to offering every gymnast the best professional instruction in an organized program that sets a high standard. We will strive to bring out the best in every gymnast. 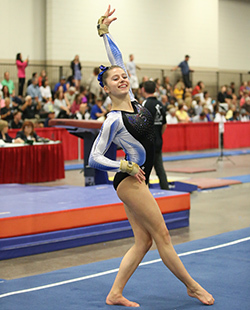 Gymnasts begin participation in competitive USA Gymnastics Junior Olympic sanctioned meets beginning at level 4. Time commitment increases tremendously when gymnasts begin competing. Competition is at the state level; however two out of state travel meets per year (within driving distance) are required. 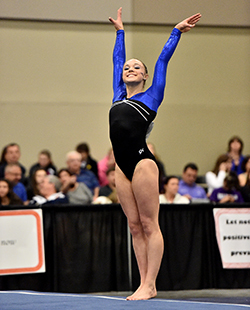 Gymnasts will compete in approximately 10 meets per year. Gymnasts perform compulsory routines in each level. The compulsory routines are developed by USA Gymnastics with varying levels of difficulty. The intent is to make the level 4, 5 and 6 routines progressive to one another. All level 4 athletes will perform the same routines as well as levels 5 and 6. These levels are the introductory levels of competition where gymnasts learn to perform and have their skills critiqued by certified judges. Routines are extremely intricate with little room for variation. Core skills are emphasized in these routines as well as dance movements. Gymnasts are required to conform to the styles and techniques of the compulsory routines where an emphasis is placed on form, posture and presentation. The compulsory levels provide gymnasts with a foundation of discipline and strong basic skills. At the optional level gymnasts have the opportunity to qualify for regional and national championships with each progressing level. In addition to travel for championships, gymnasts will have at least two out of state travel meets per year. All other competitions are held within the state. The optional levels require a very serious commitment due to the grade of difficulty and increased risk involved. Gymnasts will begin performing more complex skills and combinations. Proper training and preparation at the early pre team and compulsory levels is essential for success at these levels. Beginning with Level 7, routines are designed specifically for the individual athlete, where routines will enhance strong points and distinctive style. Gymnasts will be scored upon their level of difficulty, execution, artistry, and originality. Each level provides a new set of more difficult requirements on each event that must be included in routines. 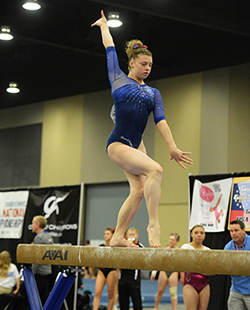 Currently Stars & Stripes offers training for gymnasts through level 10. As our gymnasts approach the upcoming levels, we will grow with our gymnasts and cater to their needs by providing the level of training they require.